In International Shipping any motorized vehicles that require DMV registration (autos, trucks, motorcycles, mopeds, jet skis, ATV’s) are considered by U.S. Customs (and Foreign Customs) as motor vehicles. International shipping cars (and other types of motor vehicles) from the USA overseas using any type of international ocean freight services is subject to special procedures related to U.S. Customs and safety issues. International shipping cars procedures (same as procedures on international shipping of other types of motor vehicles) using international ocean freight services make shipments containing motor vehicles slightly different from international shipping of general cargo. Note: This web page does not cover procedures on importing cars to the USA. (It applies on other types of motor vehicles being shipped to the USA using international ocean freight services) Import procedures on international shipping cars to the USA governed by a variety of special U.S. regulations. As an U.S. OTI: International Ocean Freight Forwarder, AMID Logistics, LLC currently does NOT offer service on importing cars to the USA. EXPORT ONLY. International shippers, which may concern of shipping cars to the USA (Import cars to the USA) should search for an international shipping company, which specializes in shipping cars to U.S. preferable in a country of origin. SHIPPING OCEAN FREIGHT RO-RO: RO-RO in international shipping means "Roll On/Roll Off". 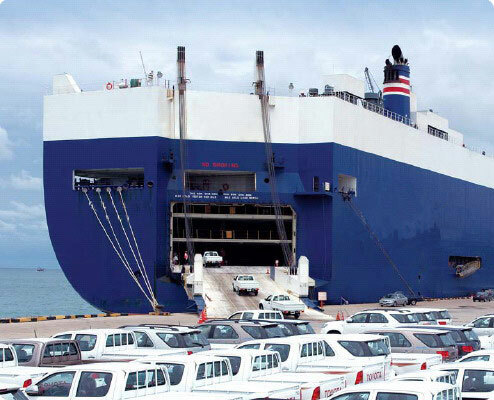 RO-RO is a shipping term used in the international ocean freight shipping industry for shipping wheeled cargo, which is driven on and off the vessel: cars, trucks, boats on trailers, wheeled constriction equipment, railway carriages etc. SHIPPING CARS FROM THE USA INSIDE OF CONTAINERS: Cars (and other smaller motor vehicles, such as motorcycles, boats, jet skis, ATV’s etc) will be loaded and secured in multimodal ocean freight containers. 1. SHIPPING A SINGLE CAR IN CONTAINER: This option should be selected for international shipping of valued vehicles. Shipping single cars in containers has higher probability to reach the destination without damages during the transportation. 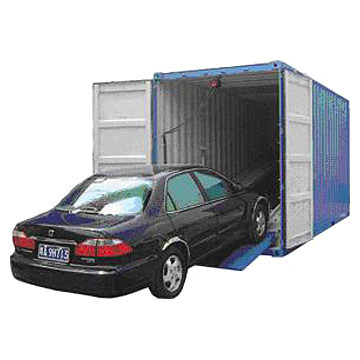 Shipping single cars in containers may be the only option if your origin and/or destination is landlocked cities. I.e. your container must be delivered to the port of departure or/and to the final destination by trucks and/or rail. International shipping cars in entire containers has the advantage that your ocean freight bill of lading will be consigned to a single consignee/recipient of car(s). I.e. the shipper and consignee will eliminate possible problems, delays and additional costs related to consolidation/de-consolidation cars at the origin and destination. 2. SHIPPING CARS CONSOLIDATED IN CONTAINERS WITH OTHER VEHICLES. That means that an internationally shipped multimodal sea freight container will contain more than one vehicle. Consolidated cars may belong to one owner or to different owners. If a container contains vehicles that belong to different international shippers and/or cars consigned to different consignees, then the container may incure problems related to finalizing of international shipping documents at the origin or/and the destination, delays and be subject to additional costs due to consolidation/de-consolidation cars at the origin or/and destination. Note: International shipping of smaller motorized vehicles (motorcycles, jet skis, mopeds, mopeds, ATV's etc) from the USA using international ocean freight will not be permitted to move as LCL sea freight. This is due to U.S. Customs Regulations. U.S. Customs will not recognize any international ocean freight carrier's container freight station (bonded warehouse) an exam site for the inspection. However, it is permitted to ship auto parts using international LCL sea freight service. You may ship auto parts from the USA overseas using the international LCL ocean freight service. U.S. Custom regulations on international ocean freight shipments containing motor vehicles require the original title along with at least three copies (non-notarized) of the title, front and back to be submitted prior to the international shipment from the USA. These documents are considered as essential international shipping documents on shipping cars (other types of motor vehicles). It must accompany motor vehicles to the port of origin (international ocean freight carrier's Container Yard - CY or pier). If there are any liens against the vehicle, a notarized letter from the lien holder authorizing the export of the vehicle must also accompany the vehicle. However, motor vehicles with liens most likely will not be approved by U.S. Customs to the international shipment from U.S. If owner of vehicle, as in the vehicle title, cannot accompany the vehicle to the port of departure, then the owner may issue a power of attorney to the person or company that represents the vehicle's owner before customs in the port of departure (international ocean freight shipping company, international ocean freight forwarder, quality loading warehouse on cars shipped from U.S. overseas etc). Most customs over the world require that the original title(s) must be presented to the destination customs at a time of recovery of motor vehicles being shipped from the USA. If a vehicle had been sold to the consignee (recipient) and shipped using international ocean freight service, then bill of sale(s) should be presented at the destination as well. I.e. as soon as your motor vehicle had passed U.S. customs, in order to avoid possible extra charges at the destination due to lack of proper international shipping documents, we strongly suggest to international shippers to express mail all original documents to the consignee without delay. If motor vehicles are shipping from the USA in multimodal ocean freight containers, then doors of the ocean freight containers must not be sealed and locked at a time when U.S. customs officers check the vehicles and its VINs inside of the containers. Easy access for U.S. customs officers to internationally shipped vehicles and to its VIN numbers (as a rule on the left side under windshields) must be provided. Otherwise, loaded ocean freight containers may be rejected to the international shipping from the USA by U.S. customs. Then it may be required to be returned to an international shipping company's loading dock for the reload. Note: If you are loading and securing motor vehicles in multimodal ocean freight containers by your own, without involving an international shipping companie's quality loading dock, then, unless you are not a professional in loads of containers for the international shipping, we strongly recommend considering to hire a quality loading or moving company experienced in shipping cars from the USA oversea. SAFETY, CUSTOMS AND OTHER ISSUES ON INTERNATIONAL SHIPPING CARS FROM THE USA USING OCEAN FREIGHT SERVICES. Unless a motor vehicle is not on the trailers (international shipping of boats on trailers for example) then the shipped RO-RO vehicle it must run and be filled with gas, but no more than 1/2 tank of gas (1/4 is recommended). Ignition keys must accompany vehicles shipped ro-ro. Motor vehicles have to be in running condition to be accepted by ocean freight carriers to the international RO RO shipping (roll on/roll off). If a motor vehicle will be delivered fo the RORO shipment to a RO-RO ocean freight carrier's pier in not running condition, then extra charges related to towing of not-runners on/off RORO vessel apply. Vehicles shipped RORO on trailers (shipping boats, jets, motorcycles on trailers) are subject to international shipping's safety requirements similar to international shipping cars in multimodal seafreight containers. See below. IMPORTANT: If you ship cars or other types of motor vehicles from US using international RO-RO ocean freight service, then you CANNOT ship anything inside of it, except for factory installed equipment. International RORO ocean freight carrier will not be liable for any spare itens shipped RO-RO along with the vehicles. International shipping cars in containers, unlike shipping cars RO-RO, requires that: all fluids must be drained and fumes purged from the gas tank, the battery disconnected and the battery terminal cables secured. You may not leave keys inside of vehicles. If you ship CARS IN CONTAINERS CONSOLIDATED WITH CARS THAT BELONG TO OTHER OWNERS, then you should not use salons and trunks of cars as an additional room for your international shipment. Shipping spare items inside of your car, except for factory installed equipment, may result to problems with U.S. and destination's customs. However, if you still insist to put something in salons or trunks of your cars, accept the risk of problems and allowed to do that by an international shipping company, then insure that VIN is not blocked for the view when a customs officer will match the VIN with the titles of your cars. Note: If you are shipping smaller cargo from the USA, then we recommend considering our international Economy LCL Ocean Freight service. If you ship CARS IN CONTAINERS THAT ENTIRELY BELONG TO A SINGLE SHIPPER, then you can use all spare room of your containers, including salons and trunks of your car to ship additional cargo along with your cars in containers. However, in this case, besides of original titles on shipping cars you must provide to customs complete valued packing/inventory list of all items that you ship in containers along with your cars. AMID Logistics, LLC, as an international U.S. Freight Forwarder, may offer SERVICES FROM QUALITY LOADING WAREHOUSES (international shipping companies loading docks), which specialize in loading and securing cars and other types of vehicles in multimodal ocean freight containers for the international shipping from the USA overseas. International shipping companies loading docks may also complete all U.S. Customs formalities on shipping cars from US on behalf of shippers. If an international shippers are going to pickup ocean freight containers from ocean carrier's container yards in purpose to load cars in the container by themselves then as U.S. Freight Forwarder, upon approval, we may offer an ocean freight bookings from steam ship lines for international FCL ocean freight in order to ship the containers with cars overseas. Then shippers will be held responsible to complete all procedures related to pickups and return containers, loading and securing of shipped cars in the containers, U.S. Customs formalities on shipping cars etc. Any surcharges that for any reasons may be added by steamship lines to ocean freight prices confirmed in bookings scheduled for shipping cars from US will be on shipper's account. If you are moving overseas from the USA, then you may compare shipping costs on shipping cars from US offered by international moving companies Vs. international ocean freight shipping companies (freight forwarders, NVOCCs). Most likely you may find that services from international moving companies appear more convenient than from an international shipping companies. However, if you understand how the international shipping cars industry works and compare shipping costs from an international moving companies to shipping costs from international shipping companies, then you will be able to save hundreds or even thousands dollars on shipping cars from the USA overseas. There are no straight standards in the RO-RO international ocean freight rates structure for shipping cars from the USA overseas. International shipping rates RO-RO vary depending on international RO-RO ocean freight carrier's standards and types of vessels used for your RO-RO shipment. Since international RO-RO vessels desks are designed to ship different types of vehicles (you may compare international shipping RO-RO of cars of small and mid-sizes to RO-RO shipping of huge excavators for example) then, in general, international RO-RO shipping rates in price quotes initially offered by international shipping companies will be based on overall volume of your RO-RO shipment in cubic feet (CBF) or cubic meters (CBM) calculated based on measurements provided by RO-RO shippers. International RO-RO shipping rates also depends on type of shipped vehicle (or RO-RO shipped unit). In general, international RO-RO ocean freight rates per CBF or CBM will vary depending on size of vehicle shipped Ro-Ro. Exemption would be international RO-RO ocean freight rates for shipping small and mid-size cars. If you shipping cars from the USA using RO-RO service, then the international RO-RO ocean freight rates may be a lump sum in US$ based on makes, models and years of shipped cars. But you should understand that in the reality, in order to get a RO-RO shipping rate in a lump sum, international RO-RO carriers have created and use in its practice special ocean freight rates matrixes, which refer to overall volumes of cars shipped from US based on it make, model and year information. I.e. international RO-RO ocean freight rates on shipping cars are based on its overall volume anyway. For example: Cars up to 600 cubic feet of total volume and up to 1.6 meters high - $1,300 lump sum + BAF & CAF etc. IMPORTANT: Your international RO-RO shipment will be measured at a SSL's (Steam Ship Line, Direct international shipping company) pier. If overall dimensions of RO-RO shipping unit retrieved by SSL will differ from dimensions given by shipper at a time of booking of his/her international RO-RO shipment, then additional shipping cost will apply on the total RO-RO shipping cost initially quoted by an international shipping company to the shipper. Your total ocean freight cost will be calculated as a total volume of your RO-RO shipped unit in CBF or CBM multiplied by the RO-RO rate per CBF or CBM depending on type of the RO-RO shipping unit, plus surcharges on the RO-RO ocean freight rate. In the international RO-RO ocean freight there are other types of ocean freight cube tables used by international ocean freight carriers besides of on shipping cars from US overseas. As long as a shipper provides make, model and year of vehicle, the total volume in CBF or CBM may be defined directly by the international shipping company and ocean freight per CBF or CBM offered for the calculation of total shipping cost of the international RO-RO ocean freight. International ocean freight rate per one car consolidated by a freight forwarder in a multimodal sea freight container with other cars that balong to other shippers (a) OR per entire ocean freight container containing two, three or more vehicles loaded and secured in containers to be shipped from the USA on behalf of one international shipper/owner (b). You may see international ocean freight rates that corresponds with these types of loads in our online freight calculator for shipping cars from US in containers in this link. Shipping costs in this online freight calculator are all-in/"Free Out". 1. INTERNATIONAL OCEAN FREIGHT RATE FOR SHIPPING CARS FROM U.S. PER ENTIRE SEA FREIGHT CONTAINER: The option A in our online freight calculator. In other words the price is ocean freight only. I.e. per an FCL ocean freight booking scheduled with a steamship line only. That means that shipper is completely responsible for stuffing and securing cars in containers. 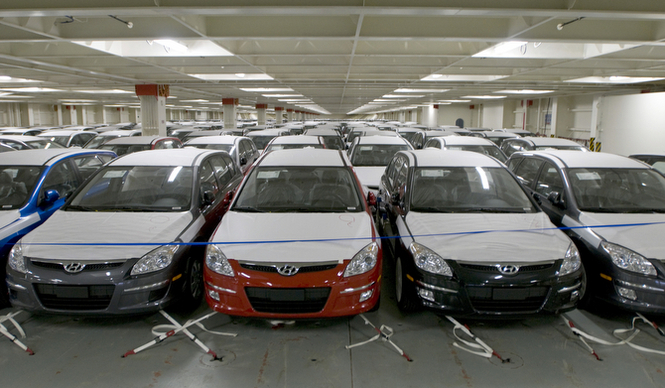 Shippers are held responsible for cars titles validation with U.S. Customs. You should read and understend these international ocean freights shipping rate as rates for shipping FCL – Full Container Load with the commodity: new or used cars, motor vehicles etc. Often FCL ocean freight rates (shipping cost related to an ocean freight booking offered to a shipper) on international shipments of containers that contain cars (other tupes of motor-vehicles) will include additional surcharges on top of the ocean freight rate itself. Certain international shipping companies do not accept shipping cars from the USA in multimodal ocean freight containers. Generally shipped cars will be consolidated in a 40' High Cube ocean freight container. Sometimes it can be most convenient and economical way to ship cars from US using service from international shipping companies. However this service is not always available. This ocean freight rate will include loading and securing cars in a ocean freight container by a professional quality loading company. Shipping cost will include passing U.S. Customs formalities with title(s). International shipper (or freight forwarder on shipper's behalf) should arrange delivery of car(s) to a parking lot of quality loading company (international shipping company's loading dock) and leave it there along with all required documents for the international shipment by sea. As long as cars are ready to be loaded in ocean freight containers, this quality loading company should take care of everything including passing U.S. customs formalities. As long as vehicles have passed the U.S. customs, all international shipping documents will be returned back to the shipper or (by shippers request) forwarded directly to the consignee or to a destination receiving terminal. Depending on sizes of shipping cars, it may be up to four-five cars consolidated in one multimodal 40' or 40HC ocean freight container. However, in order to insure a quility load it can be three or even only two cars in container only. If you are shipping luxury or antique cars (valued cars) from US, then we would recommend shipping single cars in entire 20' or 40' ocean freight containers. If you ship numerous cars of different makes and models, then the international ocean freight rate should be offered per entire sea freight containers including an offer for most efficient way for staffing and securing of your cars for the international shipment. Then an international shipping company (freight forwarder or NVOCC) will discuss with the loading dock and specify how many particulars cars may fit in a particular ocean freight container for the international shipment from the USA. For example: international ocean freight rate for 1 x 40HC containing two Dodge Neon, 2003 and one Chevrolet Cavalier, 2006 $2370 + BAF & CAF etc, including stuffing cars in the sea freight container and customs formalities. According to customs rules of most countries over the world, original titles of cars imported from USA, upon arrivals of shipping cars to destinations, must be presented to destination customs. If a car had been sold to the consignee (recipient) before an international ocean freight shipment, then bill of sale should be furnished at the destination as well. I.e. as soon as your car(s) have passed the U.S. customs, in order to avoid extra charges at the destination due to lack of proper documentation, always express-mail all original documents to the consignee without delay. If shipping cars from US using international ocean freight service is a new business for you, then in order to predict a complete shipping cost related to recovery of your shipping cars in your destination country, we would also suggest you discussing procedures on recoveries imported cars at destinations, including your destination customs formalities on cars imported from the USA, with someone experienced in the business. It can be an individual whom you can trust to, an international ocean freight freight forwarder (an international shipping company in your country), your destination county's customs broker etc. Procedures and prices on internatoinal shipping cars from US offered by an international shipping company differs from services from procedures and prices on international shipping cars by international moving companies (as a rule on ocean freight shipments related to international shipping of household goods oversea). With an international moving company your can get a sea freight container delivered to your door and have your car(s) loaded and secured by the international moving company along with the rest of your household goods. International shipping companies, most of the times, do not offer such service. Loading and securing cars in containers for the ocean freight shipment, unless you request a load in the international shipping companie's quality loading warehouse, is shippers responsibility. When you ship cars from the USA overseas we suggest you always to compare prices and service packages offered by international ocean freight shipping companies (international freight forwarders, NVOCC) Vs. international moving companies. Generally, international ocean freight rates offered by international shipping companies include port fees at origin. However, should your vehicle needs to be stored at the port of origin or at a parking lot of quality loading warehouse for any reason (i.e. lack of proper international shipping documents, waiting time for other vehicles coming to be consolidated in the same ocean freight container etc), storage fees etc, will increase shipping cost of your international shipment and are shipper's responsibility. Please plan your international shipment from US in advance. International ocean freight prices in quotes on shipping cars from US do not include storage fees (if any), handling and custom related charges and fees at the destinations. In respect of dealing with an international shipping company, shipper should clearly understand that he/she is completely held responsible for description and legality of commodity and sufficiency of international shipping documents submitted to an international ocean freight shipment. Carrier's international ocean freight bill of lading is the final shipping document that acts as a title to the goods shipped from US overseas, as a rule states 'SHIPPER'S LOAD AND COUNT' and 'SAID BY SHIPPER TO CONTAIN'. That means that a direct international ocean freight carrier (and a freight forwarder who represents this carrier) is not held responsible on information provided by shipper at a time of booking of international shipment. A freight forwarder should guide shippers in complexity of international ocean freight shipment's procedures. However, it is shipper's responsibility to provide all necessary documents related to his international ocean freight shipment that will be required by origin and destination country officials. The original title along with at lest three copies (non-notarized) of the title, front and back. Liens against the vehicle (if applicable), a notarized letter from the lienholder authorizing the export of the vehicle exported from U.S.